Two nights ago I dreamed I went to visit Albert Kuhns son Noah. Albert was the family member who assisted me in the restoration of Amish Acres in 1969. He was torn between the farm becoming Amish Acres or an industrial park. He knew it couldn’t remain an Amish farm. He therefore sided with us to preserve and restore the original farm buildings. They are still here forty years later. He has been deceased twenty years. Noah, who taught Amish school for nine years, is now retired and lives in a new gross daadi house built for him by his son on the farm he sold to the next generation. This afternoon I spoke to the Amish Adventures Elderhostel that arrived Monday and will be here all week. Just as I was leaving my office to meet them, Noah Kuhns was standing over by the cider mill talking to two visitors. He reminded me I had not seen him for three years. I invited him to sit in on my presentation which covered the history of Amish Acres, Amish history, society, and culture. It was a special treat for me and those attending. When the Kuhns family held its reunion here in 2001 I realized what a special person Albert was. In the Kuhns family history book that was sold at the reunion, Albert’s submission was the only one with drawings, detailed ones, of the Milk Shake trains that used to run on the B&O Railroad directly across the road from the house. He had a memory like no other I have experienced. His stories were detailed and colorful. He practiced the art of oral tradition in which present day society has neither time nor interest. About a year after Albert died Noah knocked on my office door one April Saturday when it was raining and he had driven the buggy to town. I invited him and his twelve year old son in to have seats. Noah said, “I thought you might like to know how dad died.” I said that I would. He set about telling me in exacting detail on what days Albert went to the hospital, who visited, when he was sent home, when he came back, and his final days. All at once I could see in Noah his father telling me similar stories about his father’s and his grandfather’s passing. Then I realized that the twelve year old was slumped in his chair paying little attention; he didn’t have to, because he had heard the stories time and again and they were etched in his memory and will be passed on when the time is appropriate. So the traditions of Amish culture in the Kuhns family are safe into the next generation. Sonya Harmon-Nash began working at Amish Acres as a soda jerk, waitress and hostess at Amish Acres during her college summers. After receiving her business degree from Indiana University—Bloomington, she was drawn back to the farm as an assistant kitchen manager. Several months later she volunteered for the group sales position that became vacant. 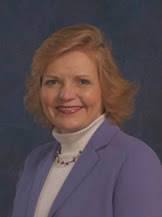 She reinvented the position becoming the first from Amish Acres to attend national trade shows. The twelve American Bus Association members of the 2008 Top 100 Selection Committee met in the Brandywine Valley in Pennsylvania and Delaware, in June 2007 to select the Top 100 Events for 2008 from among hundreds nominated by state and provincial tourism offices and local convention and visitors bureaus. The esteemed list was published as a supplement to Destinations magazine: Motor coach Travel across North America, the official publication of the ABA in its September issue. For the third time in six years Amish Acres Arts and Crafts Festival in Nappanee, Indiana has been named to the roster as it celebrates its 46th year. The festival will be held July 31 – August 3, 2008. The Nappanee festival is the only private event in the nation to make the Top 100 list. Other attractions mentioned as being close to Amish Acres include the University of Notre Dame, the RV National Heritage Museum and the College Football Hall of Fame. 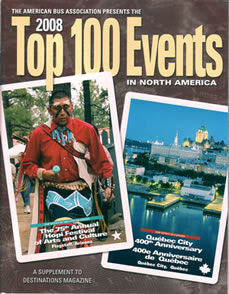 Heading the Top 100 list is the Top Event in the United States, the 75th Annual Hopi Festival of Arts and Culture in Flagstaff, Arizona and the Top Event in Canada, Quebec City 400th Anniversary. Additional events that are internationally known annual affairs include the Indianapolis 500 Festival, the Preakness Festival in Baltimore, the Tournament of Roses in Pasadena, California, Macy’s Thanksgiving Day and the Philadelphia Mummers Parades, Mardi Gras in New Orleans and the National Cherry Blossom Festival in Washington, DC. International Canadian events include the Calgary Stampede, and the Montreal International Jazz Festival. Joining the Amish Acres and Indianapolis 500 events in Indiana is the Feast of the Hunter’s Moon in Lafayette. Events from surrounding states feature the National Cherry Festival in Traverse City, Michigan, the Chicago Air and Water Show, the Professional Football Hall of Fame Enshrinement Festival, in Canton, Ohio, The Wisconsin State Fair and the Kentucky Derby Festival. Other events featuring the arts are The Main Street Fort Worth Arts Festival, WheatonArts Festival of Fine Craft in Millville, New Jersey, The Prix de West Invitational Art Exhibition in Oklahoma City, The Main Street Fort Worth Arts Festival and the Boardwalk Art Show and Festival in Virginia Beach. The Round Barn Theatre at Amish Acres will be celebrating its 23rd season of Plain and Fancy on the Joseph Stein Stage named for the author of Fiddler on the Roof. Rodgers & Hammerstein’s Carousel will fill the stage during the performing arts celebration at the Nappanee festival. The Oregon and Utah Shakespeare Festivals join the Canadian theatre festivals, the Shaw Festival at Niagara-on-the-lake and the Stratford Festival of Canada in additional performing arts celebrations based on the timeless plays of William Shakespeare and George Bernard Shaw. The American Bus Association is the North American trade organization representing the intercity bus industry. Its members include bus companies that offer tours, charters, and scheduled service; travel members representing virtually every segment of the travel and tourism industry; and associate members who supply the industry with goods and services. The 2008 Top 100 Events are listed on the ABA’s Web site at http://www.busses.org/. A complimentary copy may also be obtained via email request at abainfo@buses.org, fax at (202) 842-0850, or in writing at American Bus Association, 700 13th St., N.W., Suite 575, Washington, DC 20005. 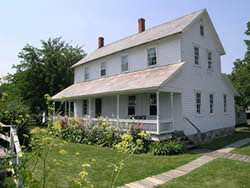 Information on Amish Acres Arts and Crafts Festival may be obtained at http://www.amishacres.com/.